The mystery of Rennes-le-Château has inspired treasure hunts, theories about the origins of Christianity, and the best-selling novel and film The Da Vinci Code. The mystery concerns Bérenger Saunière, the 19th century priest of an impoverished hilltop village in southern France who became immensely wealthy after apparently finding ancient parchments hidden in his church. Although the secret of the source of his money died with him, he left behind enigmatic clues that have puzzled researchers ever since. 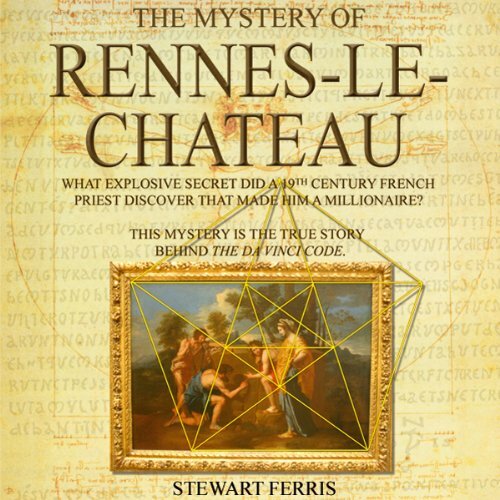 In this audiobook, Stewart Ferris, author of The Key to The Da Vinci Code, tours Rennes-le-Château searching for evidence to support the leading theories as to the origins of Saunière's fortune, but in doing so he comes across people and clues that lead him to draw fresh and original conclusions of his own. This audiobook is based on the DVD programme of the same name. Click here to see all the titles in our Da Vinci Code collection. I was looking forward to listening to this programme as I am fascinated by the theories surrounding the life of Christ. This should have been an excellent listen but for me, it was ruined by the presenter who positively gabbled through the first half. The incidental music was some of the worst I have ever heard and could and should have been replaced by more discussion on the subject matter of the programme. A real shame and an opportunity lost to inform the listener about the various myths of Rennes Le Chateau.